Tashi Tsering, the 61-year-old former director of the Nyalam county health bureau, has witnessed huge changes in Tibet's medical system. In 1966, Tashi was among the wave of the government's hastily trained medics known as barefoot doctors that provided basic medical care. He was sent to help rural farmers and herdsmen in Nyalam county in Tibet's Xigaze prefecture. After three months of training in the county hospital, he was dealing with a wide range of ailments, from diarrhea to appendicitis and even delivered babies, with little more than some anti-inflammatory pills and painkillers. "Once, a woman almost died giving birth to twins but I could do little to help her and her babies," he said. "When the second baby came out three days after the first one, it was dead." Tashi said there was only one hospital in the county and there were no roads to some of the remote villages 160 km away. According to an official report, before the peaceful liberation in 1951, there were no modern medical institutions in Tibet, except for three small, shabby government-run organizations that dispensed Tibetan medicine and a small number of private clinics that together had fewer than 100 medical workers. 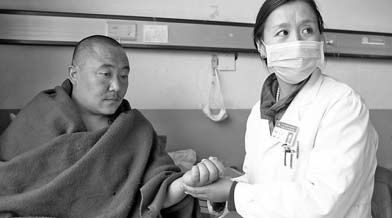 Tibet now has established a basic medical service across the whole autonomous region. Tashi said now there are three hospitals in the county, and every village has at least two medics. A free medical service system, the first of its kind nationwide, has also been founded. Tsering Norbu, a 33-year-old Xigaze resident, said 85 percent of his medical fees for treatment following a car accident were reimbursed by the government. "Residents can borrow 5,000 yuan ($770) from the local health bureau and get the money reimbursed by the government if they cannot repay it," Tsering said. In 1995, Tashi organized training for grassroots medics with the support of local officials. They have trained more than 370 Tibetans and 60 percent of them now work as full-time medical staff in Xigaze. Tashi said medical workers also educate residents on medical knowledge. "In the old Tibet, few people knew about and accepted vaccines. Being afraid of needles and injections, women ran away carrying their babies when I went to their tents to persuade them," said Tashi. "The tradition of giving birth at home causes many infections, dead babies and dead mothers." Dondrup Drolma, a 26-year-old Tibetan woman, said she was born in a cattle-shed. "Sometimes, people keep the labor a secret in case it will bring bad luck to the baby," she said. Tashi said in order to encourage women to give birth in hospitals, the government gives 100 to 200 yuan in subsidies to every patient and covers their transport expenses. According to official reports, the average lifespan of Tibetans increased to 67 years in 2011 from 35.5 years before 1951. The population of the autonomous region also increased, from 1 million to 3 million. Meanwhile, the maternal mortality rate dropped from 50,000 per million in 1959 to 1,748 per million and infant mortality fell from 43 percent to 2.07 percent. Tashi attributes the improvement to the government's constant investment in medical development. But he said Tibet still needs more well-trained medical workers. "Surgeons are still needed in many regions in Tibet," he said. "More local Tibetan medics, most of whom are taught for several months in local hospitals, should be sent to medical school for at least two years of training."